The horrendous lack of traffic discipline among Belgaumities is what is becoming increasingly evident with the shutting down of operations for construction of the ROB. While the inconvenience of having diverted a large traffic to the poor (quite literally)Congress Road is a truth that cannot be denied, the sheer apathy towards traffic rules or rather common sense is adding to the woes. 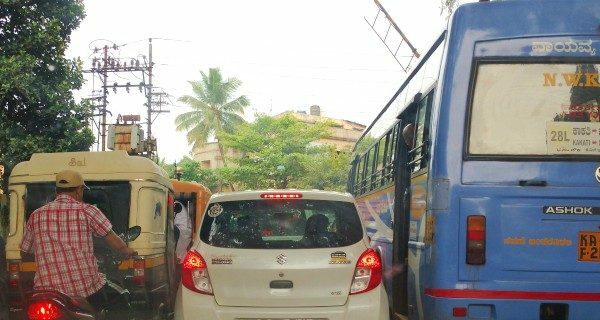 The picture is a scene at 2nd gate and while it might be routine for auto drivers to take any twist and turn as they normally do, in testing times like there, unless the 2 lane system is implemented, traffic will only continue to clog the roads. On trying to convince the autowalas to act otherwise, they just gave the advisor a snub and continued to snake their way through whatever space was available. To add to the trouble, there was no traffic Policeman at the 2nd Gate at around 8.50 AM and hence the vehicles were just about managing to accommodate each other’s threats to push and shove and people tried to find their way to work. If there was a traffic Policeman there, he was not evident and definitely not in-charge. This being the commencement of the period when people start getting to work, it is definitely time for the policemen to man their stations. The diversion promises to be a challenges for well over a year and it is important that every person who takes to the roads on and off a vehicle, plays his or her role to perfection. No excuses will suffice. The problem is for us to accommodate and solve or rather manage in our best interests.